Konan Dojo, St. Francis Bushido of St. Francis SD, continues to grow under the leadership of Sensei David Halmi. 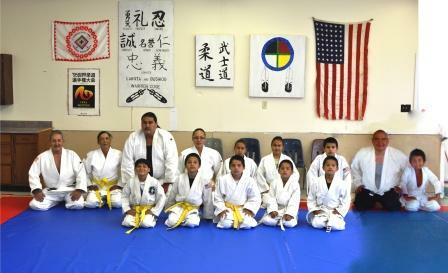 St. Francis now has 16 members studying under Sensei Halmi, who combines the principles of judo with the traditional ethic of the Lakota. Congratulations to Sensei Halmi and all the students of St. Francis Bushido Dojo. St. Francis is the first dojo to use the Konan website as home page host. Visit the St. Francis Bushido Dojo page here. This entry was posted on September 5, 2010 at 11:06 pm and is filed under Dojo News. You can follow any responses to this entry through the RSS 2.0 feed. You can leave a response, or trackback from your own site.